In a month when we’ve driven the fastest production car in existence - the 1479bhp Bugatti Chiron - it might feel more difficult than usual to get excited about 'just' 306bhp. But here’s why you should be excited. At the other end of the Volkswagen Group’s portfolio to the Chiron, 306bhp is the uprated power output of the facelifted Volkswagen Golf R. VW’s mega hatch has had a few tweaks to tip its power output over the 300bhp mark and boost its torque by 15lb ft to 280lb ft, all of which helps make this the fastest Golf ever made. Faster than the previous R and the Nurburgring-slaying front-drive limited-edition Clubsport S, as well as the new Seat Leon Cupra 300. 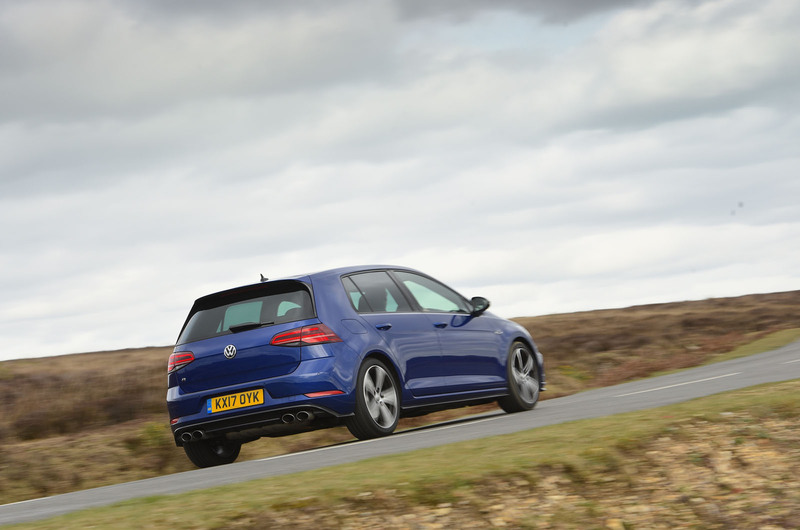 The Golf R is an all-rounder with which few come close to matching in all disciplines. Exhilarating pace and genuine practicality ensure it’s a regular pick for the 'dream' everyday family car. But while Chiron ownership remains firmly in the realms of fantasy (unless you happen to be reading this on a diamond-encrusted tablet in your Dubai penthouse), the Golf R costs just more than £30,000. That sounds like a lot for a Golf, true, but for what you're getting it’s a bargain. Especially when you consider that for the price of one Chiron you could line your estate with 78 Rs. To look at: thoroughly unremarkable. VW’s designers have certainly not gone to town on cosmetic tweaks for the exterior - look closely enough and you’ll notice new LED lighting and restyled bumpers - but a discreet appearance has always been part of the allure of the R. Hide it in plain sight among a fleet of family hatchbacks and only a select few will feel their eyes drawn to the R badge. As subtle as the outside changes are, inside, it is more of a significant change. It gets a new Virtual Cockpit-style configurable digital instrument cluster and central infotainment system that can be controlled with gesture control. The screen is crisp and clear but it has lost the useful physical buttons and rotary knobs that surrounded it - it’s a step forward in terms of technology, but it may not be ergonomically. After all, it’s simpler to reach out and touch a physical button while you’re driving than grabbing at a specific part of a glossy screen that’s indistinguishable by touch. Start the engine and an aggressive engine note ignites - albeit artificially enhanced - ready to be coaxed into a guttural growl or recede into the background on a motorway cruise. Although not natural, it does sound suitably yobbish and an Akropovic exhaust option can be ticked for even more throatiness. On the move, the engine is responsive and free-revving, and the performance is nothing short of rapid, zinging along up to and beyond motorway speeds with minimal effort. It even returns fairly palatable fuel economy. For peace of mind to go with the pace, plenty of standard safety equipment features too, such as adaptive cruise control, predictive pedestrian protection and city emergency braking. It’s great that VW has bucked a growing trend and opted to keep a manual gearbox option. The six-speed unit is a joy to interact with, it's consistent weight helping deliver a thoroughly engaging drive. The manual does carry a performance deficit over the automatic - in three pedal guise the R gets from 0-62mph in 5.1sec (quicker than the 5.8sec managed in the front-drive Golf GTI Clubsport S) with the automatic R at 4.6sec. However, opting for the automatic costs more than £1000, so we’d be tempted to pocket the cash and enjoy the greater involvement that three pedals bring. Happily, the R's chassis is never overwhelmed by the performance on offer, displaying poise, genuine adjustability and unrelenting grip, thanks to the standard all-wheel drive setup. Its steering is quick but it’s responsive and offers a confidence-inspiring amount of feel, while the all-wheel drive system pushes power towards its rear wheels when the front begins to struggle to fend off understeer. The ride is on the firm side, but not uncomfortable and you can add Adaptive Chassis Control to bring yet more versatility to the car. If there’s perhaps one thing missing from the Golf R, it’s perhaps a bit of a soul - some quirky character. It is, after all, a Golf, not a car that will cause you to go misty-eyed at its styling, nor turn many heads on the street. But, as you blast your way through each and every journey soaking in its well-rounded brilliance, it’s unlikely you’ll care. Yes, you should. Very few cars offer this kind of sophisticated all-round package, with brutal performance and everyday usability and, to top it all, a digestible price tag. To call it an astonishing all-rounder might sound like damning it with faint praise, but it really isn’t. It has the dynamic qualities of sports cars that cost many times more, and it’s as practical as, er, a Golf. For around a £3k premium over a Golf GTI, the R brings more power and a more intense experience. We're enjoying a staggering era of hot hatches, and while the Golf R had its work cut out in an ever-improving class, this facelift has done nothing to spoil its exceptional formula. 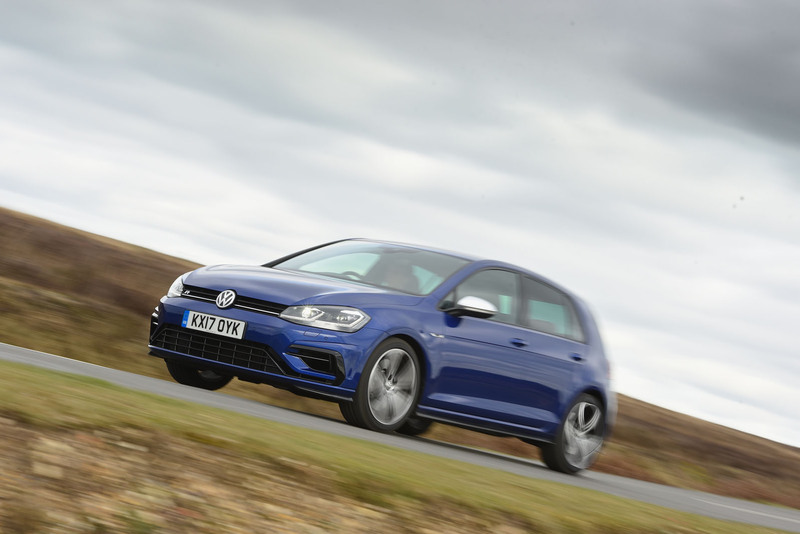 In November 2014, we named the Golf R as the best car on sale in the UK. It was second in a repeat of the test a year ago. For 2017? You wouldn’t bet against it troubling the podium again. "Yes", you say. Of course you say that: this magazine floods its pages with 'positive' VW stories and reports. Will not work chaps, the Golf is dull, uninspiring, and made by VW. For more than a couple of hours or actually owned one for greater than a few weeks, if so you might just change those fixed in concrete / ill informed views . When you are older you may if you are lucky be intellectually sufficiently mature to recognise that there are views other than yours, and that to describe another's views as 'fixed in concrete / ill informed', because they do not align with your opinion, actually says much more about you than it does about me. Now grow up. See my comments on the following page. Your response would be welcome. Just to push you and repeat vrs' question: have you actually driven one? In other words, are you opinions not only different but genuinely ill-informed? So, have you driven one? Wow, I created an account just so I could say that this is one of the most horrendously condescending and unnecessary things I've read on the internet in a while. You sound like an absolute tool. It's ridiculous that you should stand behind maturity and intellect, then completely fail to justify your point on any logical terms. You need to grow up, badly, because most 6 year olds can make better arguments than 'when you're as good as me you'll understand'. You made a blanket and totally un-explained statement, someone called you on it, and then rather than justify what you said so that we could all better understand your point, you doubled down on the total lack of justification. How about next time you have something to say, you justify your point, so it adds to the discussion rather than being unnecessarily insulting to everyone who comes here to actually read and talk about cars. "the Golf is dull, uninspiring, and made by VW. All Golfs are dull, or this Golf R is dull in all aspects? Everything made by VW is bad? Like contemporary politics, it's easy to invent an enemy, to identify an object of derision, in order to vent your hate & anger. I certainly don't want to live in such a binary & simplistic world. Indeed I am old boy, but there are diesels, and diesels. I've looked at other makes/brands for a replacement but cannot find one that gives sure-footed all wheel drive, performance, quality and comfort for the price. You can park it and not worry that it will be keyed or missing upon your return.